Address: Tongxin Road,Leyu Town, Zhangjiagang City,Jiangsu province China. Carbonated Beverage Filling Machinery are manufactured by advanced technology, and we have completely equipment, so they enjoy fast sales. The filling line combines rinsing bottles, filling bottles and capping bottles together with PLC control. It is mainly used for plastic bottles with carbonated beverages and non-carbonated beverages. 1. All parts contacting with beverages adopt top grade stainless steels whose surfaces are polished till smooth for easy rinsing. The sealing materials are EPDM rubber. 3. Adopt PLC as center control, make use of pressure transmitter and electromagnetism pneumatic valve to measure liquid level, keep balance of filling pressure to insure stable liquid level. 4. Adopt new type filling valves which are especially designed for plastic bottles. The returned air and the liquid in filling tank are insulated to insure cleanliness of the filled beverages. 5. Adopt advanced magnet clutches for capping with adjustable torsional moment to insure capping safely and reliably. A. High automation level, compact structure, attractive appearance, convenient and simple operation, safe and reliable and adjustable continuous production capacity, low labor intensity. C. The key electric elements adopt products made by international famous companies, such as Mitsubishi and Siemens. These series carbonated drink filling machine can handle max 3 liter pet bottle. 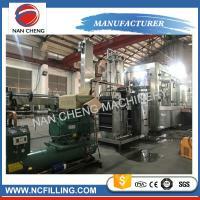 Welcome to inspect Carbonated Drink Filling Machine in our factory.